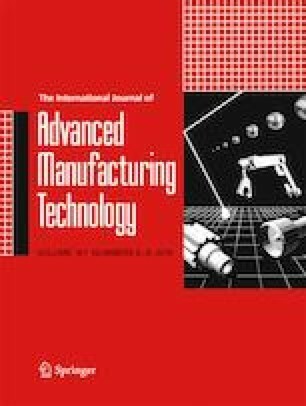 In this paper, a novel high-speed rotary ultrasonic elliptical vibration-assisted machining method (HRUEM) for side milling is proposed to overcome problems associated with short tool life and low process efficiency during the titanium alloy finishing process. First, a theoretical model of separate-type HRUEM is presented and matching mechanisms and vibration period delay coefficient are fully analyzed. Feasibility experiments were performed used to compare the HRUEM method under different parameter matching conditions for titanium alloy milling with the conventional milling (CM) method. Then, a detailed analysis of process outputs including cutting force, chip formation, tool flank wear, surface topography, and roughness was performed. Based on the analytical model, micro-chips can be achieved with reasonable parameter matching using separate-type HRUEM. The process was further investigated experimentally to determine the tool life. Negative relief angle cutting introduced by HRUEM is found to be crucial and may prevent improvement in tool life. However, tool life of separate-type HRUEM with no negative relief angle cutting can be extended several times compared to CM. In addition, microscope observations of the machined surface revealed more uniform microstructures with HRUEM under reasonable parameter matching cutting conditions.